Grandma Sugar, my mother-in-law, crocheted the Easter baskets above for her great-granddaughters and filled the baskets with treats and love. That was the last Easter Grandma Sugar celebrated. She passed away in August of that year. 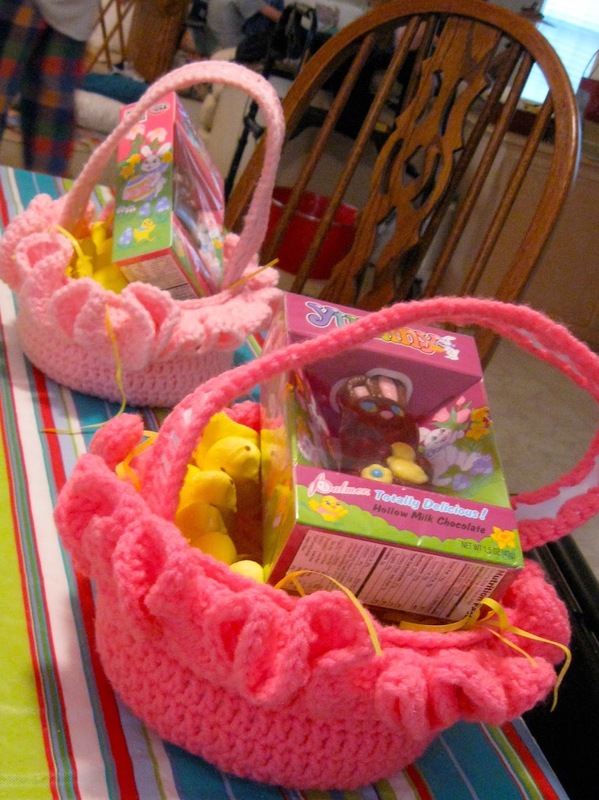 The baskets that her great-granddaughters have used in their egg hunts ever since are a happy reminder of how much she loved her family and loved making every holiday special. Easter Sunday morning March 31, 2013, our four visiting grands dashed about in our backyard to find the hardboiled eggs they had dyed the night before. Sudden shrieks from Charlie sent parents, grandparents and siblings rushing to her side. 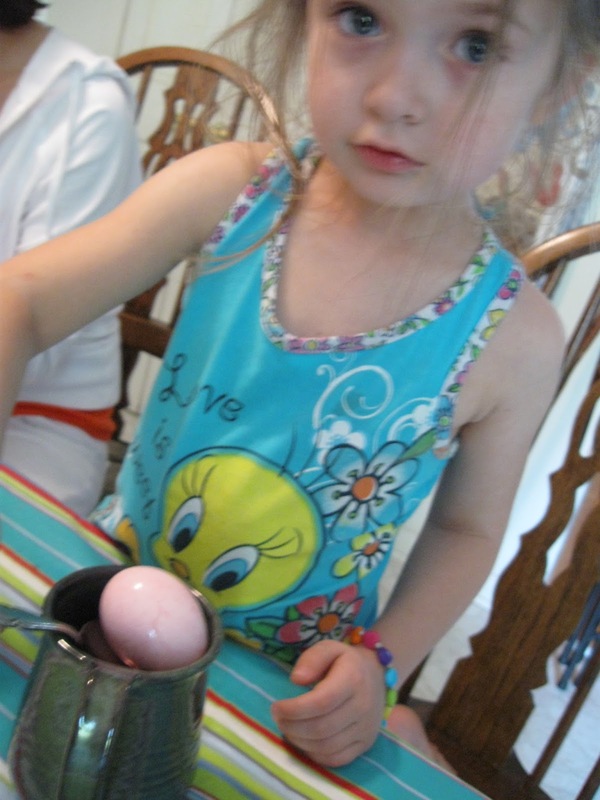 An unwelcomed visitor was oozing out of a small circular crack in the egg she had just found. It was a baby slug. Ewwww! Seven-year-old Charlie resumed her search. She screamed again. Another slimy invader. Yuck! 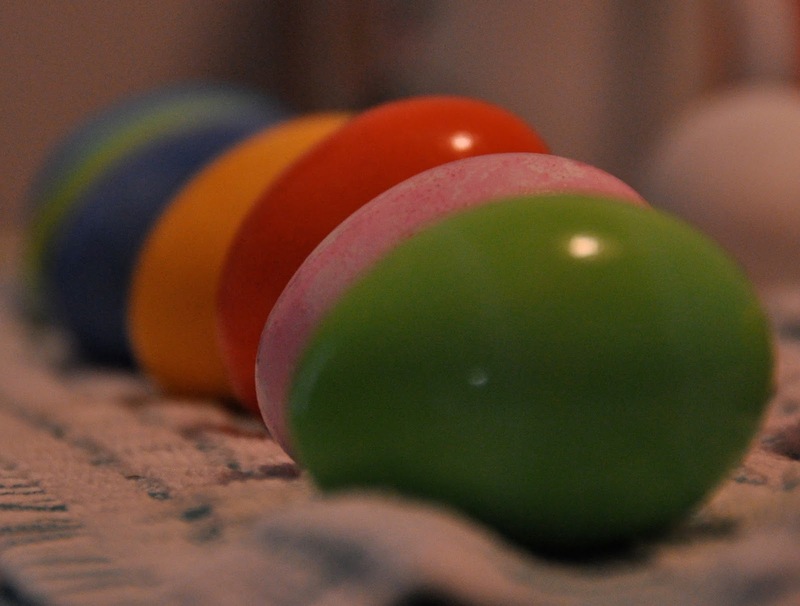 - Tradition 4--Eating one or more of the colorful eggs after the hunt. 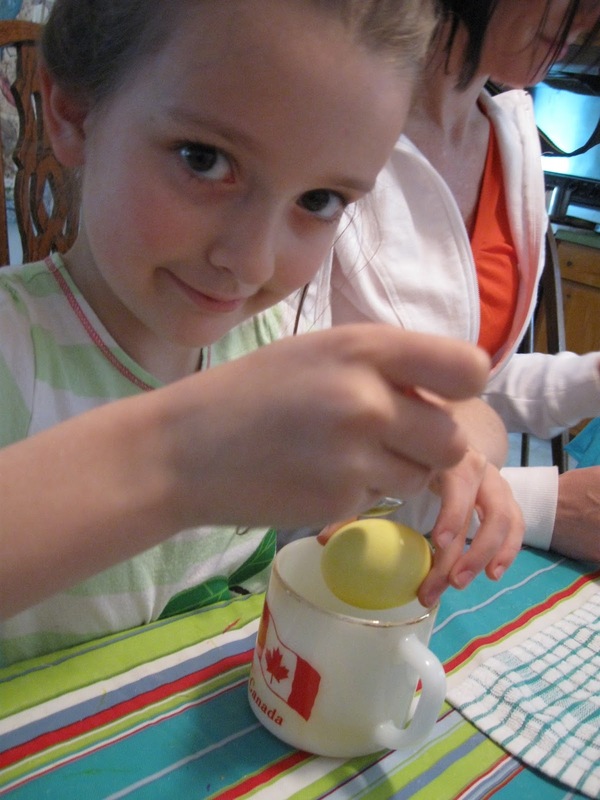 When everyone returned inside, Mom Sarah offered to peel eggs for the children. There were no takers. Neither kids nor adults indulged. The surprise attack of icky fauna fractured the egg-eating tradition that Easter morning. 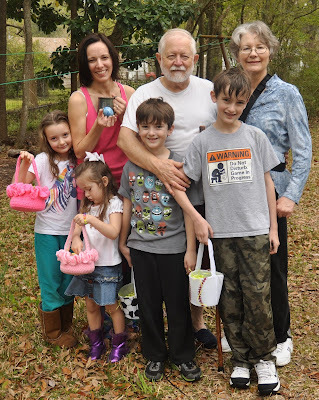 This year we again spent Easter weekend with our oldest son and his family but this time at their home. I was glad to see that they continued traditions using real eggs. 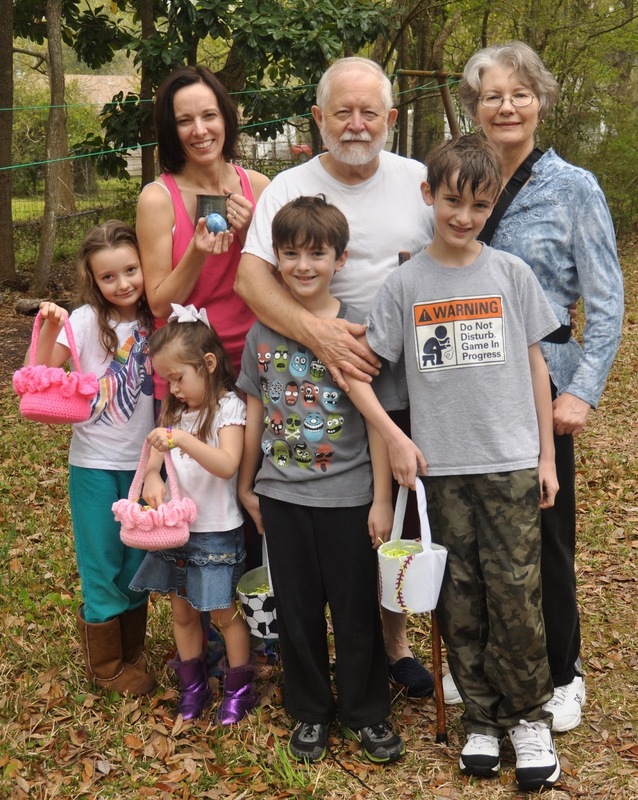 There were no slugs this year, and a few eggs disappeared along with Easter bunny candy. 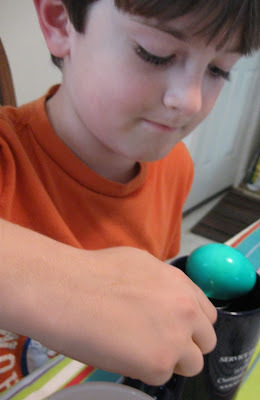 ugh on those slugs, they did a fantastic job of coloring the eggs. that was always our tradition when mother was alive. Grandma sugar sounds a lot like my mom... glad you got ot have your family egg hunt and no slugs attended. I do love the traditions of Easter but we really didn't do any this year. Both Granddaughters (16 years and 21 years) came home from our Mexico Mission trip under the weather and I was completely exhausted too. We "potlucked" at daughter in laws home and just sat around like bumps on a log. Even though I'm whining...we did celebrate our Risen Lord. 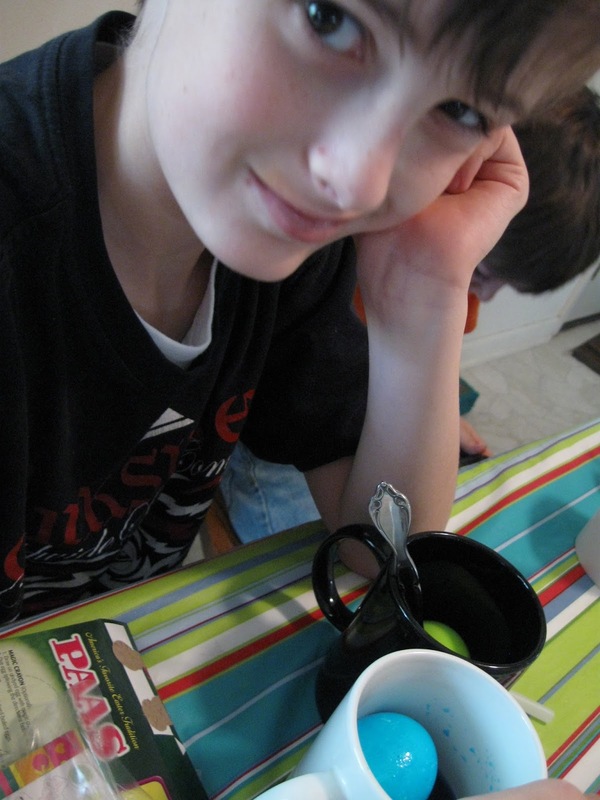 I enjoyed reading about your Easter traditions. They're very similar to ours, with the exception of hiding real eggs. We switched to hiding plastic ones a long time ago. It's a good thing because we never find them all! I absolutely love those adorable baskets crocheted by Grandma Sugar, too. I'm sure they'll be treasured for years to come. I'm glad y'all had a nice Easter, with family, and that your traditions are being carried on. Those are fine looking eggs and the baskets are adorable. what geat keepsakes for the children. Love your alliteration with the slugs, i.e. fauna. I'm just now catching up with you. Loved the tradition of the lovely Easter baskets. How wonderful. It was strange this year not to be dying eggs with the grandchildren. Mine are growing up and not interested anymore. How are you doing? I think of you often and lift a prayer in your behalf. Goodness, I read your post earlier today, and now cannot remember if I commented! SO...the Easter baskets will be family heirlooms. Your family is so beautiful! Those iccky slugs will make that an Easter that no one will forget, it will go down in family history! You and your husband have not changed at all! You both look so good!